The visual arts program at SI includes photography, sculpture, studio art, art & architecture, art & nature, sacred symbols, sculpture and multimedia design. The program began in 1977 when Katie Wolf (pictured above on the left) offered to develop a course of study in for SI students. Katie was a St. Rose graduate who had studied fine arts at Santa Clara University and had earned an MFA at the San Francisco Art Institute. She had acted in plays at SI and, later, assisted Peter Devine by designing sets. For nearly 30 years, she has developed curriculum and taught the creative process to thousands of young artists whose work has earned national honors. In the 1990s she led a summer workshop for students who designed large-scale outdoor pieces that are on permanent display around the school. 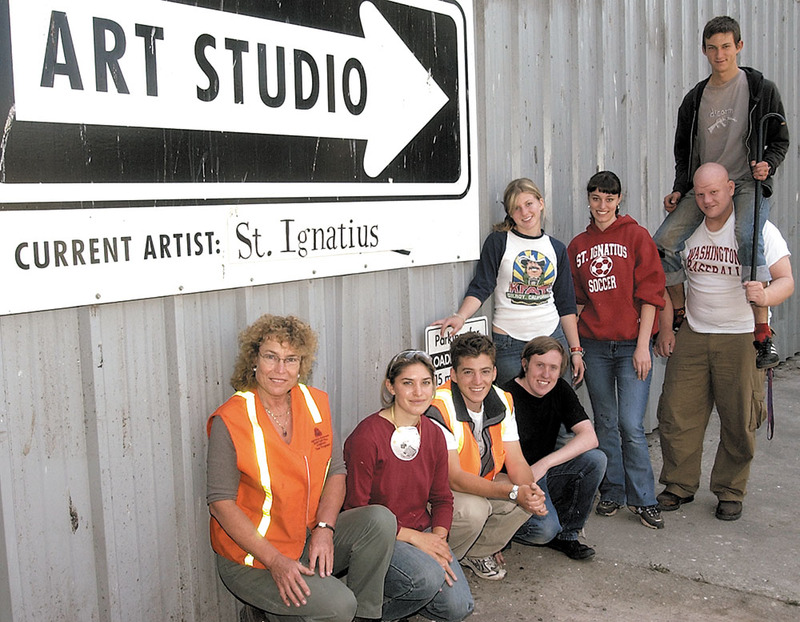 In the summer of 2003, she and a group of students (pictured above) were artists in residence at the NorCal Transfer Station near Candlestick Park where they transformed trash into works of art. In 1993 the San Francisco Unified School District honored her as the Outstanding Art Teacher of the Year and featured the work of SI students at the de Young Museum. St. Mary’s Cathedral also chose her to be its official fabric artist for San Francisco’s cathedral, and all the banners and in that building are her creations. Her work ranges from environmental fabric designs at St. Mary’s to stained-glass pieces, steel sculpture and Byzantine icons in intimate sacred spaces. She redesigned Jensen Chapel on the SI campus in 2003 when the school moved that facility from the second floor to the Student Activities Center, and her work incorporated her sense of the natural and the sacred.